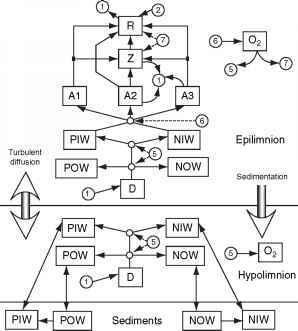 Figure 2 Spatial representation of a lake described as a diagram: segment 1 - deep hypolimnion zone; 2 - metalimnion; 3 - epilimnion; 4-8 - shallow litoral zone. the system and how. The internal structure in this case is not analyzed, and we describe the system by finding an appropriate function that translates inputs into outputs. This is usually done by statistical methods. In contrast, in a process-based model we describe the structure of a system, which is best done by a diagram, representing the major components of the system: variables, forcing functions, control functions. When deciding about the model structure, it is important to match the structural complexity with the goals of the study, the available data, and the appropriate temporal and spatial resolution. For example, if we are modeling fish populations (Figure 3), that grow over several years, there would be little use in considering the dynamics of bacterial processes, that have a specific rate of hours. In this case we may probably think of the bacterial population as already at equilibrium, quickly adapting to any changes occurring in the system in the 'fish time', which is weeks or months. We may still want to consider the bacterial biomass for mass balance purposes, but in this case it makes perfect sense to aggregate it with the detrital biomass. 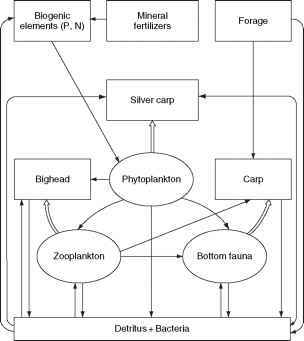 Figure 3 Structural representation of a fishpond ecosystem. biomass changes much slower. We might want to consider oxygen as part of the system to make sure that we do not miss such critical regimes. In a lake ecosystem model in Figure 4 in addition to trophic relations certain spatial properties are depicted. The diagram shows how the model structure is presented in the three vertical segments that describe the pelagic part of the lake. In the upper part three phytoplankton groups (A1, A2, A3) are present; they are food for zooplankton (Z) and fish (R). 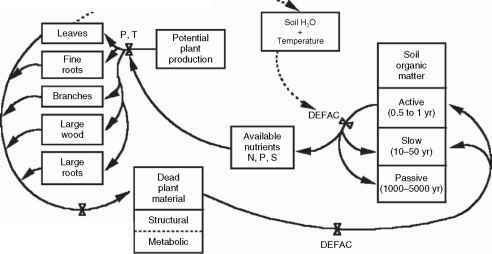 Various forms of nutrients (organic and inorganic nitrogen and phosphorus) are supplied by decomposition of detritus. In the bottom segments, there is no biota, only nutrients and detritus. When making all these decisions about the model structure, its spatial and temporal resolution, we should always keep in mind that the goal of any modeling exercise is to simplify the system, to seek the most important drivers and processes. If the model becomes too complex to grasp and to study, its utility drops. There is little advantage in substituting one complex system that we do not understand by another complex system that also we do not understand. Even if the model is simpler than the original system, it is useless if it is still too complex to shed new light and to add to the understanding of the system. Figure 4 A conceptual model of a lake ecosystem, which includes elements of spatial and structural description. Figure 5 Forrester's formalism for conceptual diagrams. The rate and the level are two main icons that can be used to put together more complex diagrams such as the one for the insect population. From http://www.ento.vt.edu/~sharov/PopEcol/lec1/struct.html. (Figure 5). Levels were used to identify storages of material or energy, while rates were controlling the flows between them. 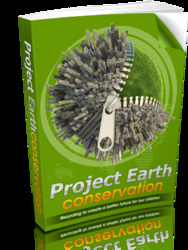 Using this formalism Forrester created complex models for such systems as cities, industries, and even the whole world. Similar formalism was later used in several modeling software packages. Odum created another set of symbols to model systems based on the energy flows through them. He called them energy diagrams, and used six main icons shown in Figure 6. All systems were described in terms of energy, assuming that for all variables and processes we can calculate the 'embodied' energy. In this case energy works as a general currency to measure all processes and 'things'.